This newspaper clipping, from the New York Times, features a group of women gathered during a coal mine strike near Pittsburg, Kansas. 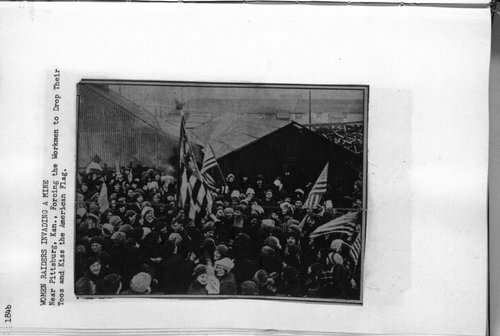 Dubbed the "Amazon Army," the women marched through the coal fields carrying large American flags to show their support for better wages and improved working conditions for their family members who worked in the camps. The caption reads: "Women Raiders Invading a Mine. Near Pittsburg, Kan., forcing the workmen to drop their tools and kiss the American flag."